Today (Tuesday) we are taking a rest day in Escalante. We are staying at Escalante Outfitters, another do it all establishment. They are a motel, campground, liquor store, coffee shop, internet cafe, pizza place, book store, and a hiking/camping store. 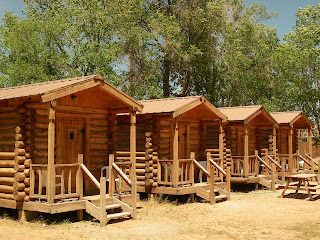 Belinda and Dave are staying in one of these little log cabins (which seem to be in all the private RV/campgrounds). It's nice to be in a bed again. John has pitched his tent again as he must watch his pennies. 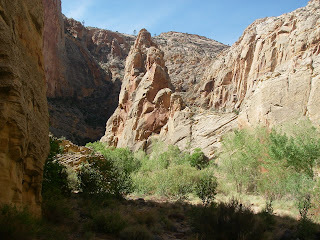 This morning we went for a hike down the Escalante River canyon. Two years ago we paddled up the Escalante arm of Lake Powell with Bill. So now we've seen the river from the other end. We haven't been disappointed yet. Glad you guys are getting some rest. 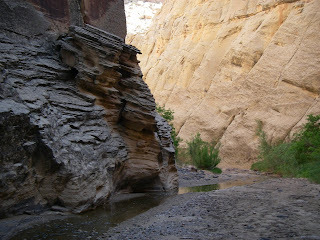 and those pictures of red canyon are great. i'm having a great time. yesterday i saw, among many other things, Michelangelo's David. i never realized how huge it is! today we went through the Ufizzi gallery, what used to be the Medici family private collection, a huge building full of paitings and sculptures. i'm resting up this afternoon and then going to a concert of organ music tonight! Your blog is like the Discovery channel, only better. We actually know the participants. Amazing photos. The one of Jack should be published. Looks like the weather is in your favor for once. I love the West (I guess why I live here) but you're telling me that on your rest day you went hiking! So glad you're able follow us. Sounds like you're having a great time. Enjoy the pasta, it will be the best you've ever had. Weather is warming up, but still comfortable. Now we've seen the start of the Escalante river, the middle (June 13th post), and the end in Lake Powell. It is an amazing place that we will come back and explore. What killer pictures, as usual. I was lucky enough to boat on Lake Powell last spring, and can't wait to cruise through Escalante. Good to hear that Crossfitters think hiking is REST! In answer to your question, Dave, my best friend and I rode across from Oklahoma to Portland, and down the coast until I crashed 63 miles south of Big Sur. We slept in churches and under bridges, and ate beans out of cans. I grew to despise the wind, and vowed never to do it again, but you three are making me VERY envious. Congrats to Daniel, Florence is such a blast!